We are providing a comprehensive series of Ammonia Receiver. Our product is made as per universal industry norms by employing the optimum grade material that is sourced from top retailers of market. Our product is broadly employed for their sturdy design and longer service life. Established in the year 1985 at Delhi, we, Ahuja Refrigeration Co., are counted among the prominent Manufacturer, Supplier, Exporter and Wholesaler of premium quality Refrigeration Compressor Spare Parts, Ammonia Valves & fittings and Refrigeration Products. Our products are available to clients in an exhaustive range to suit their various needs. These products are manufactured at our modern infrastructure facility by using premium quality raw materials. 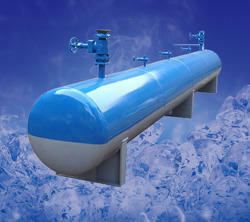 Our products are made in accordance with the International Refrigeration Standards and OEM parameters. Because of their excellent quality, our products are highly demanded in various sectors of the market both in India and abroad. Consistency in the delivery of premium quality products and services has helped us become a preferable firm for the clients to deal with.